Creatine and caffeine are two performance-boosting supplements often used in sports settings. There is a lot of controversy, however, over the effectiveness of using these two substances together. A study published in the October 2001 "Journal of Applied Physiology" showed that caffeine blunted the effects of creatine; however, a 2002 study in the journal "Medicine in Science in Sports and Exercise" showed caffeine could be ergogenic, or performance enhancing, after creatine supplementation. After learning more about these two supplements and what they do, you will be able to see that taking creatine and caffeine together can be beneficial. In some cases this supplement combo may not be effective, however. Your body's primary reaction to caffeine is the speeding up of your nervous system. The stimulation of your nervous system allows you to mobilize more fat for energy and helps reduce your perception of fatigue as you exercise. Creatine supplementation boosts the natural creatine stores in your body. Creatine can be utilized by your body as a quick form of energy during high intensity, short-burst activities such as lifting a heavy weight or breaking into a sprint. The most significant interaction between creatine and caffeine is the way they influence the hydration or water level of your body. Stimulation of your nervous system means that all parts of your body are stimulated, including your urinary system. Caffeine causes you to urinate more often and expel a greater volume of urine. Creatine supplementation causes your body to retain more water than it naturally would. Extra creatine in the muscles must be accompanied by a greater intake of water, because each molecule of creatine must be bound to water in the muscle. This poses a big problem as caffeine tries to flush water while creatine tries to store it. Since creatine and caffeine battle over your hydration level, you need to consume more water throughout the day in excess of normal guidelines. The National Institute of Health recommends that a normal individual consume six to eight 8-oz. 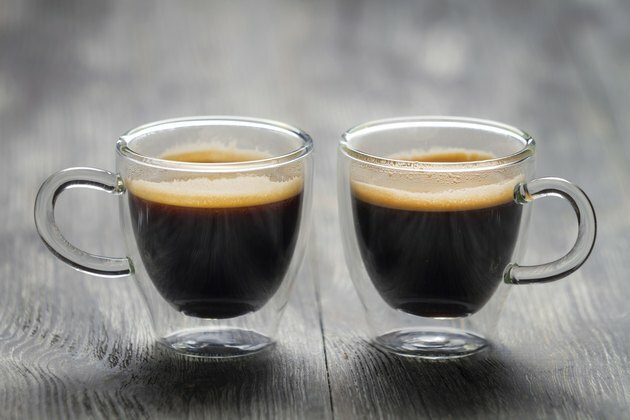 glasses of water per day; however, if you use both creatine and caffeine you should drink at least two additional 8-oz. glasses of water, for a grand total of eight to ten 8-oz. glasses a day. Caffeine use should be limited to those days when exercise or your sporting event occurs. Using caffeine continuously diminishes its performance-enhancing effects while keeping your urine output high and therefore mitigating some of creatine's performance-boosting capabilities. The best way to use the two supplements in tandem is to take 5 g of creatine every day while using caffeine only on days where maximal performance is required. However, before using either creatine or caffeine, consult your physician and nutritionist to ensure that you can safely consume these products. Why Is My Urine Yellow After a Workout?